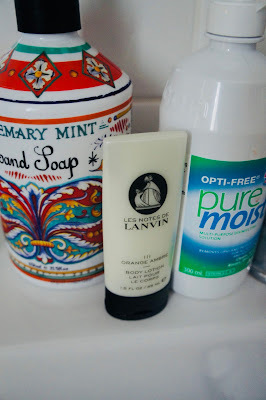 Sydney Shop Girl: Lovin' Life 15/2/2018: Surprise Staycation. but at least I have this little memento in my bathroom to remember it by. After several busy weekends, Master SSG and I took a break from getting things done and spent this last weekend exploring the city. It's been more pleasant getting around on foot now that the light rail construction is almost finished along George Street. The calm seems to have encouraged the weekend crowd to return as well so there was a happy buzzy of shoppers and visitors on the streets from quite early in the morning. I was touched by a miracle too. Behold the line for takeaway coffee at The Groundsof the City on Sunday morning! Barely there at all. After placing our order, I took a little walk along the lenght of the store to have a closer look at its decor. It's usually hidden by a crowd at least five deep. The deep green awnings, brass finishes and homely window displays crammed with produce give The Grounds such a distinctive presence in the grey marbled arcades of The Galeries. After a bit of window shopping (literally one window), it was time to head to the hotel for lunch. 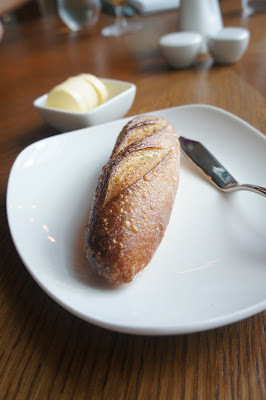 Atelier is the Sofitel on Darling Harbour's restaurant. The hotel itself only opened late last year and the entire establishment is a visual treat. There's all sorts of contrasting textures like unfinished wood against glass and the soft furnishings in each area of the hotel are just a bit different in a low key luxe kind of way. There's a champagne room to the side of the main dining room. It wasn't open when we visited but I did a lap of honour all the same. The champagne bottle arrangements were broken up every once in a while by beer taps that were literally ice cold. What I liked most about the restaurant's design was the space between tables and how peaceful it was. The bustle of Darling Harbour was nothing but a blur of colour and commotion from where we were seated. Service was friendly and knowledgeable. There is a kids menu which Master SSG loved. He was even able to read what he wanted to order. The entrees were actually large enough as a main for lunch. The prawn and lobster salad. The chicken liver pate with brioche. Both were beautifully presented and tasted as good as they appeared. From memory, both were just under $30 each. This is the actual size of one serve of the mini cheeseburger sliders from the kids menu. Those French Fries were perfect. There are different hand cut chips with the fish and chips also on the menu. I rate those too. Kids menu items are between $12 - 16. The pool area is gated off from a general sun deck area which features a full bar and range of hot menu options. I addressed my pastiness as I nibbled my blackberries from the Kings Cross Farmers Market. While Master SSG played, lazed (briefly and for the novelty of being wrapped head to toe in striped beach towels) and swam. Sydney, you're pretty fabulous in summer. Even in the city. From poolside to changeroom chic. 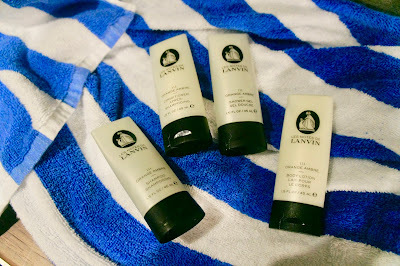 The Lanvin toiletries available for your post swim relaxation. It was hard saying goodbye. I hope we get to return soon for another staycation. Have you staycationed at a fancy hotel in your city recently? You definitely should if you haven't. Looks fabulous! We just had a staycation earlier this month but not at a fancy hotel. Still it was nice to be away, eat out, and have someone else take care of the cleaning up. It is great to explore our own cities isn't it SSG. Although my husband and I are off to Adelaide for the weekend - something spontaneous so I'm looking forward to that. Have a great week! It all looks gorgeous. I haven't spent time in a hotel for ages - maybe it's time to take a weekend break while the weather is still warm? Loved all your photos. Wow. I was so focussed on NOT liking what I was seeing in George St last week as I made my way via the Strand Arcade to Dymocks I truly did not appreciate some of what you showed us. I did however have a fab ferry ride (return to the zoo) and that was a great afternoon pre-surgery the next day! No I haven't staycationed. I'm pretty sure I would enjoy myself though. Your photos are looking great! Glad you're having fun with your new camera.